Avignon, France. A city that looks as if it is straight out of a storybook. Large, limestone cathedrals and towers sit high above the curves and nooks of the winding river city. Music blares from festivals that line the city streets during the summers. Cobblestone pathways seem to tell an ancient story of those who walked the same steps years before you even existed. If it seems too good to be true – it’s not. The city of Avignon, in France, is a real and beautiful place that everyone should see with a perfect blend of history and culture. In the late 1300s, the quaint city of Avignon was home to the Royal Papacy (aka the Pope). 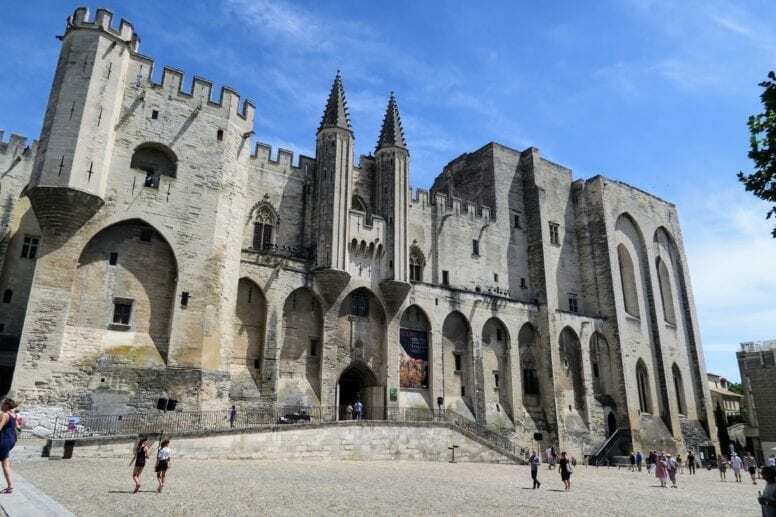 During the nearly 70 years the Pope lived in Avignon, the city was built up with towering cathedrals and palaces, the most famous among them being the Palais des Papes (the Popes Palace). However, if you are taking a 3-day trip to Avignon we might suggest that you live it up like a local – they know all the best spots! 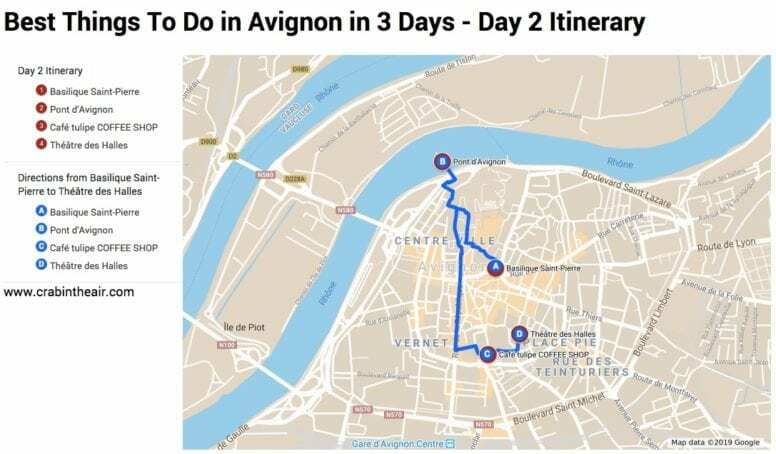 Here is our recommended full itinerary of the best things to do in Avignon in 3 days with many travel tips and top attractions. This walking tour will allow you to enjoy the city at 360 degrees – from sightseeing to shopping. 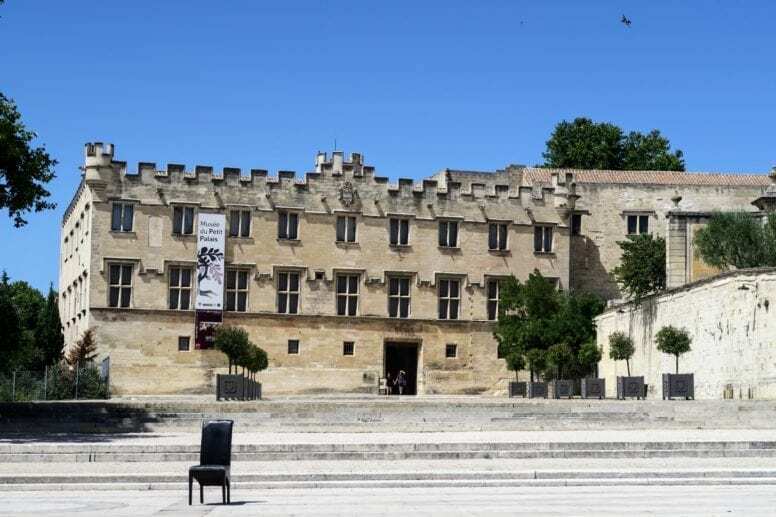 Travel tip: Avignon is a lovely town that allows you also to explore other interesting French locations. 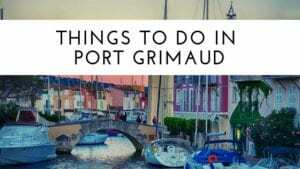 Some of the most charming towns located nearby include Port Grimaud, Saint-Tropez and Saint-Paul de Vence. 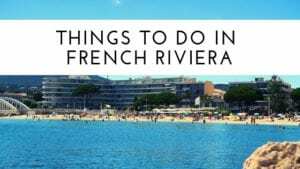 All of which are in the heart of the famous French Riviera. Spending the day like a local in Avignon, in Southern France, means taking it easy, eating great food, and drinking great wine. And, we have a few places you can do just that on your first day! (Plus a couple of cathedrals to add some history to your itinerary). To start your day out in Avignon, you need to make a trip to the Les Halles d’Avignon. This local market boasts some of the freshest produce, seafood, and flowers you will ever find. As you stroll through the numerous booths manned by locals, you will hear the chatter of the day’s news and receive recommendations on the best foods to try. We suggest gathering a block of cheese, a fresh loaf of bread, and a bottle of wine for the perfect picnic lunch. After you gather all of your goodies for lunch, you can take your provisions over to the beautiful Rocher des Doms for a stroll through the park and a picnic lunch. Near the scenic ponds and amidst the tall green trees you will see locals out for their afternoon job, enjoying a bite on their lunch breaks, and lounging on the grass with their families. You will be able to grab a bench to enjoy your picnic or a quaint table near the cafe. Now that you had your delicious lunch it’s time to do some walking and discover one of the most important places in the city – the Papal Palace. This extraordinary monument which was declared a UNESCO World Heritage Site is also the biggest Gothic Palace in the world. In the 14th century, the Papal Palace was a center of Christianity and home to nine successive Popes between 1309 and 1377. Inside, there are 25 areas for visitors to discover and admire where you’ll be able to see beautiful chapels, private papal apartments, and ceremonial rooms just to name a few. Tip: You’ll spend a lot of time standing and walking so comfortable shoes are recommended. When inside the Papal Palace take advantage of the useful audio-guide which is available in 11 languages. – July : 9am – 8pm. 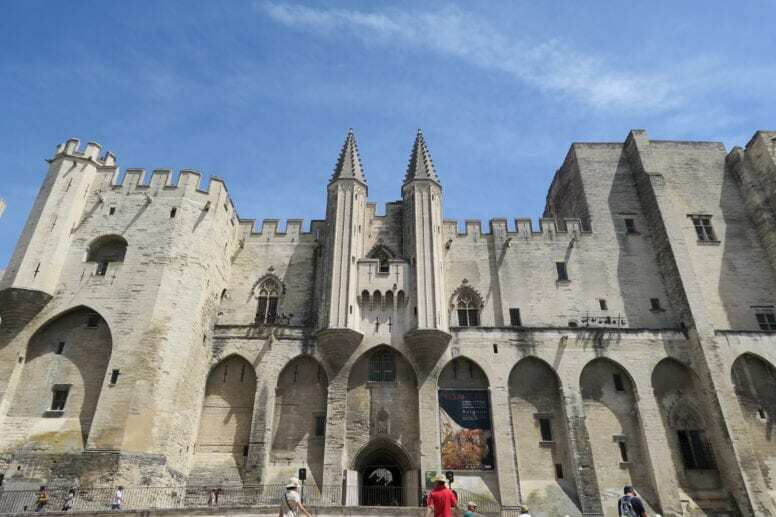 Right next to the Papal Palace sits the marvelous Avignon Cathedral (known in French as Cathédrale Notre-Dame des Doms d’Avignon). This is another important point of interest and a must-see on your 3-day itinerary. Dating back to the 12th century this Cathedral in a Romanesque style is an impressive building which was also declared a UNESCO Heritage Site. 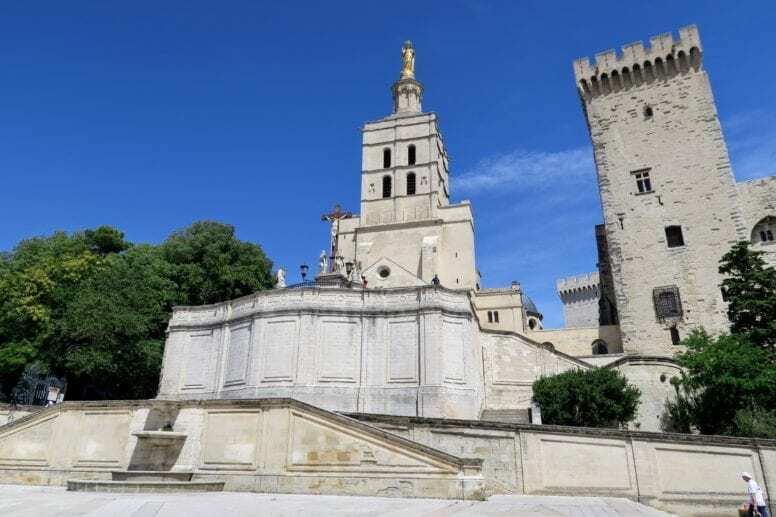 Thanks to its position on a high rocky ledge, the Avignon Cathedral can be seen from many points of the city and outside of it, even those further away. Make sure to bring your camera with you as this is one of the most photogenic points you’ll find in Avignon. From September to June – Monday to Saturday 7 am to 12:30 pm and 2 pm to 6:30 pm. Sunday – 2pm to 6:30pm. July and August – Monday to Saturday 7 am to 6:30 pm, Sunday 2 pm – 6:30 pm. Le Petit Gourmand is a quaint restaurant located in the heart of old Avignon. Far enough from the main street, Le Petit Gourmand is a favorite for locals who love to go somewhere, grab a bite, and enjoy a casual evening chatting with their friends. The seating is limited, so when you go you should expect a small wait, but don’t worry – it’ll be worth it! Everything on the menu is delightful. Opening Hours: Every Day from 12-2PM and from 7-10PM. Wednesday closed. 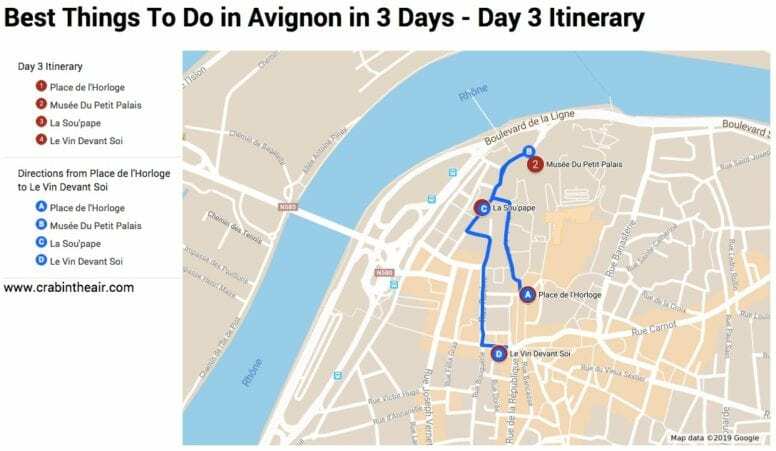 For your second day galavanting about in Avignon, you can soak up all the charm the city has to offer by following this itinerary. Even if you are not a typical Sunday morning churchgoer, you should treat yourself to a morning service at Eglise Saint Pierre. 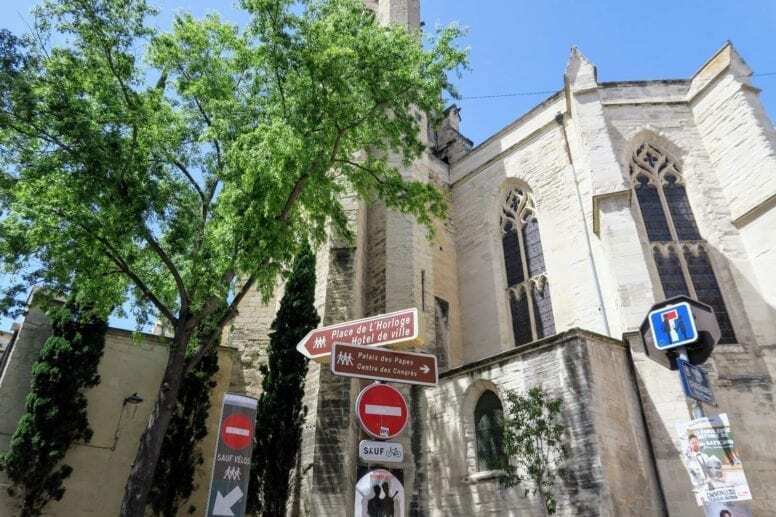 Unlike the typical tours of the historic cathedrals in Avignon, when you visit Eglise Saint Pierre for a Sunday morning service you will be able to experience the history and the grand atmosphere of the church the way it was intended. Your Avignon itinerary can’t be considered complete without seeing the famous Pont Saint-Bénézet – another World Heritage Site in the city. 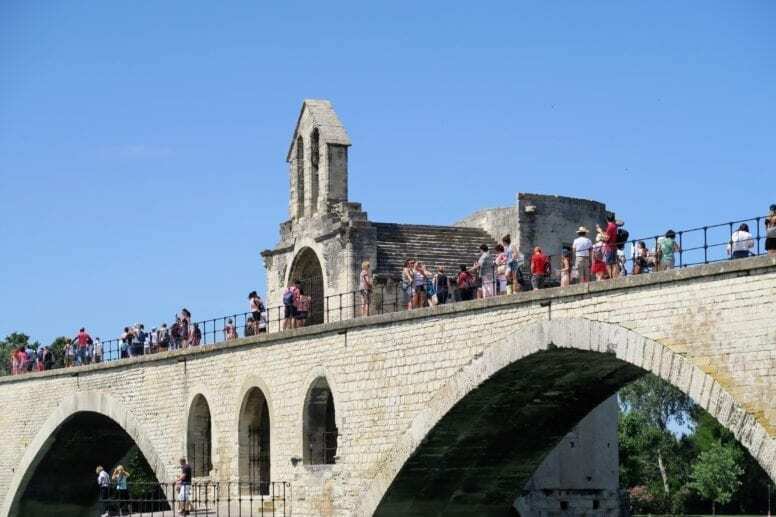 Completed in 1185, the Avignon Bridge (Le Pont d’Avignon) was damaged multiple times and has undergone multiple series of reconstruction over the years. In the past, the bridge was a strategic point of the route connecting Lyon with the ports on the Mediterranean Sea. Known as one of the best local coffee shops in Avignon, Cafe Tulipe is not nearly as crowded as the tourist-saturated shops down the street. Inside Cafe Tulipe, you will find delicious, custom coffee drinks, a variety of teas, and the most decadent dessert options you can imagine. Spend the afternoon here just observing the locals pass by, or grab a quick drink to go as you walk your way through old Avignon taking in the architecture. 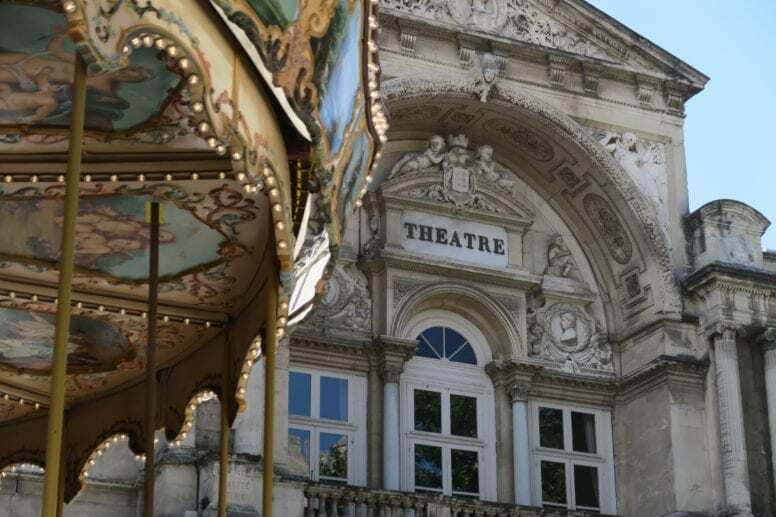 A small, local theatre specializing in unique performing arts shows, the Theatre de Halles is a one-of-a-kind destination for your weekend in Avignon. Sit down next to the most cultured locals and enjoy the show being offered for the season. The atmosphere at Theatre de Halles is unique, as it’s stage is located inside of an old, stone building near the Rhone. There is no better way to start your last day in Avignon than with a nice stroll around the Place de l’Horloge – the Clock Square. This main square in Avignon is a bustling place filled with people, restaurants, cafes and most of all with unique and positive energy. This is also where the city hall and opera house are located. The Place de l’Horloge is a paradise for photography enthusiasts and is packed with insta-worthy spots and colorful sites so don’t forget to bring your camera. Have your breakfast here, make sure to fill up on the delicious French croissants before heading to your next location. Now it’s time to burn those extra calories you just ate and walk all the way to the Musée du Petit Palais. The 14th-century structure is home to some of the most incredible paintings from the Renaissance period. Artworks from the permanent collections of this Museum include the Paintings of the School of Avignon, the Avignon Sculptures and the Italian Paintings. If you love art you could easily spend an entire day there but a couple of hours is just enough time to see everything and learn something new. 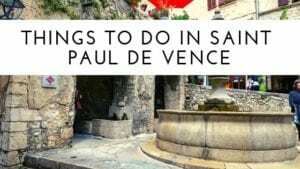 I’m sure you’re hungry again so head to La Sou’ Pape (a short walk from the Musée du Petit Palais) for some of the yummiest options available in Avignon. This lovely small family restaurant with a few tables inside and a couple outside offers delicious dishes at affordable prices. The owners are super friendly and will willingly tell you all about the food, fresh veggies and all of the ingredients they use to cook your meal. After three busy days filled with attractions and plenty of walking, you will want to take the rest of the night to sip on a few glasses of wine at Le Vin Devant Soi. Le Vin Devant Soi is a fun, local wine shop where you can pick try a few of your favorite vintages, purchase a bottle and drink it right in the shop. As it is popular among the locals why not try to make some new friends and practice your French with them? It’s not a flashy place, but it’s a place the locals love and you will too! 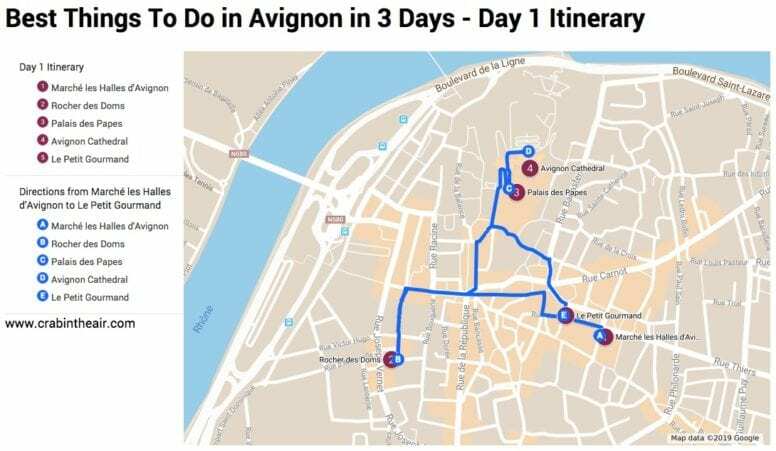 If it’s your first time in Avignon and you’re interested in seeing most of the places I listed above it’s best to book a place to stay in Avignon city center. This way you’ll be located near all the main points of interest and you’ll be able to walk from one place to another. 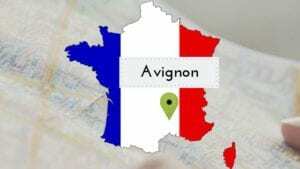 If you’re wondering where to stay in Avignon here are some of the hotels I recommend. 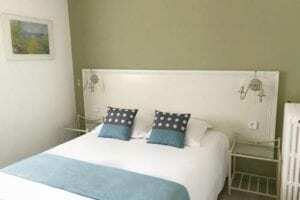 Régina Boutique Hotel – clean and quiet hotel that makes a perfect base to explore the city for your 3-day trip. 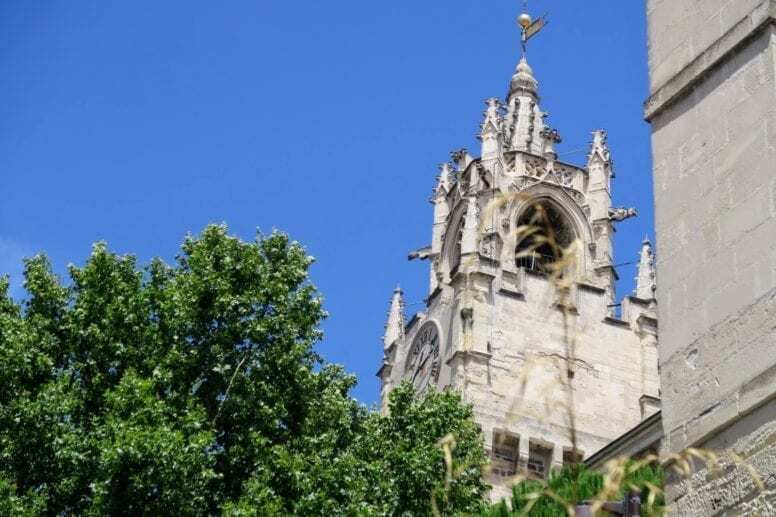 Hôtel Les Corps Saints – this 2-star hotel is conveniently located a short walk away from to the most important attractions in Avignon such as Papal Palace or Musée du Petit Palais. Le Magnan Hotel – perfect location, friendly staff, and nice breakfast. Hôtel Central – this centrally located hotel offers comfortable rooms, free wifi and a charming courtyard for the guests to enjoy. If you’re looking for a hotel outside of the city center you might want to check out the Mas Capelou B&B. Mas de Capelou is a lavish 9-room bed and breakfast in rural Avignon, Mas de Capelou is everything the locals love about Avignon and more. After waking up in a luxurious custom suite, a relaxing morning comes next. Lush green lawns grace the outdoors where you can sit under the trees and sip your morning coffee. Inside, a gourmet breakfast that has been prepared by the in-house chef will await you. Hôtel Cloitre Saint Louis Avignon – a 4-star hotel in the center of Avignon which dates back to the 16th century and offers wonderful rooms and a nice restaurant. 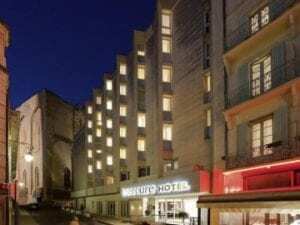 Mercure Avignon Centre Palais des Papes Hotel – located only a short away from all the main points of interest this hotel offers comfortable rooms, free wifi and access to a lovely terrace. Of course, spending 3 days in Avignon, France could include many more locations and destinations. A few that are worth mentioning are the Collection Lambert, Musée Louis Vouland, Musée Lapidaire and Rue de la République. 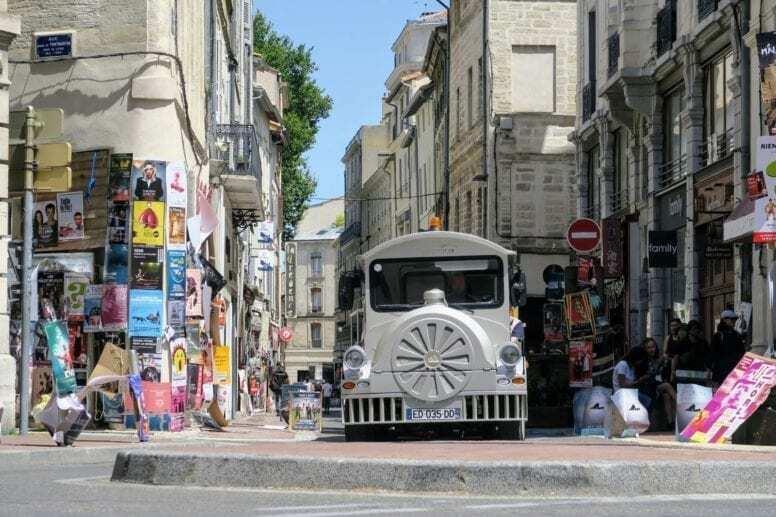 However, this detailed itinerary with the top attractions in Avignon comes highly recommended and will not disappoint even the most seasoned tourists. You can add a day trip to one of the nearby cities, or an evening out at one of the nightclubs to include a bit of your own flavor. But, whatever you do, just be sure to enjoy the beauty that is Avignon! I’ve been in Avignon last summer, it’s magical! I loved the main square and the Pope’s Palace. What a trip! All South France is lovely and has perfect weather. we couldn’t agree more. 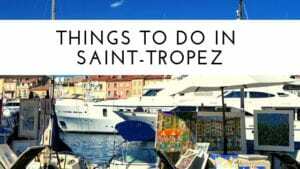 We love all the French Riviera and Provence. It’s so poetic, artistic and bucolic at the same time! 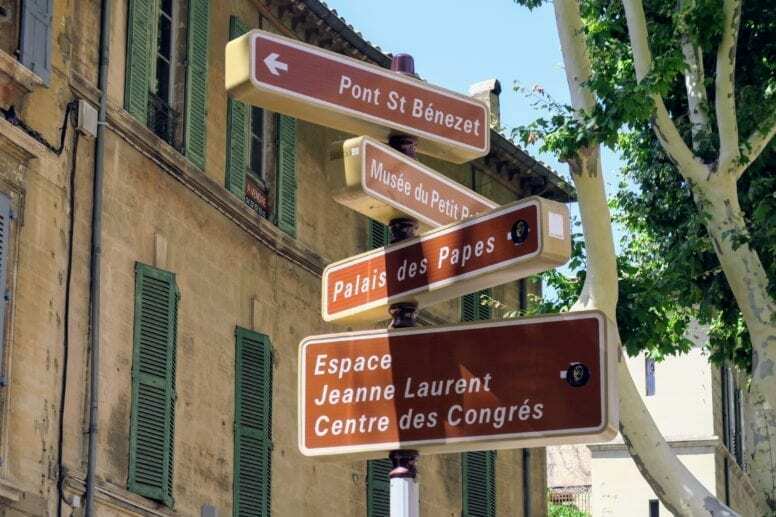 Avignon is one of our favorite cities as well, together with Aix-en-Provence, St.Tropez, Port Grimaud and Arles. Each city has its own spirit and pace. We could easily spend the whole summer in that area!